Between work and the very long streak of rainy weekends we've had this summer, it's been much longer than I hoped since the last time I've had anything to report on this part of the restoration. Tonight I decided that not being able to work on the car lately had driven me nuts so I decided to do something about it. Tonight's project was simply to inspect the condition of the driver's side rocker panel. The first thing I did was to take my trusty rust-out finder (a.k.a. an awl) and start poking around. Before long, I had made a nice hole a few inches in front of the existing rust through. Much to my surprise, there was some fuzzy stuff in there. Having been through this with every other hidden part of the car so far, I knew right away that this was a mouse nest. So I poked around a little more (ok, it was a lot more) and kept digging out the old nest. To get it all out, I had to slit open the rocker with a pair of tin snips. I only had to cut a few inches between the parts I could put my finger through (which describes most of the rear half of the rocker cover). I know this looks really bad but there is some good news here: the inner rocker is rock solid. 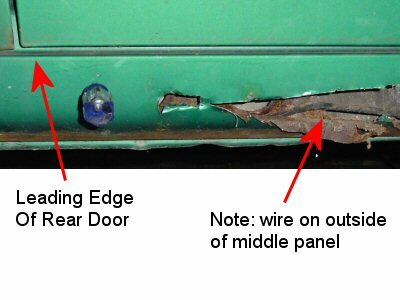 In this picture, you can see the following parts of the car: inner rocker (this is the grayish looking part in the very back of the hole), the outer rocker (a section of this is missing, you can see where it ends at the front of the hole -- there's a rusty looking part with a round cut-out in it). The final part is the rocker cover which is what most people think of when you say rocker panel. Rocker covers are available new from most AMC parts vendors for two door 1964 - 1969 Americans (I bought mine from Kennedy American). Since my car's a four door, I'll have to do some trimming on the new panel to make it fit (the upper pinch weld is flat on a two door where four door's kick up at the back end and around the B pillar -- more on that detail later). The rocker panel is much longer on a four door than a two door so if you need to do the entire cover, you'll need about one and a half covers per side. This last picture shows how far forward the rust goes. I'll end up replacing the rocker cover from about an inch forward of the door opening to the quarter panel. Once I get the cover off, I'll be able to see how much of the outer rocker (this is the middle part) needs replaced.